OSE Traxxas M41 Catamaran High Power Cable System Upgrade. 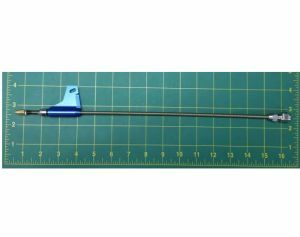 -Upgrade your Traxxas M41 Cat to a much stronger 3/16" (.187", 4.75mm) cable and shaft system. Traxxas built the M41 with a 5mm propeller shaft and .150 cable. This limits the power you can use. Most increases in power cause the stock cables to twist and break. We built this strut in standard 3/16" size and included two installed lead Teflon bushings (part# oct-oc6ltsb) for added prop shaft support. This strut is an absolute must for customers running modified motors with their M41's. OSE M41 strut with two installed oct-oc6ltsb lead Teflon bushings.